Most of the Themes used in Faculty Websites include the option to change the header image, background color and use custom menus. Some of the themes come with a selection of header images. Three of the themes include header images for the different UCI schools. You also have the option of uploading your own custom image to further personalize your website. 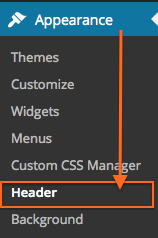 Select Header from the Appearance toolbar in the Admin area. Upload a new image and crop the image if needed. Select from one of the default images. If one of the default images meets your needs, click the radio button to the left of the image. The new header image will appear as the Preview and will be live on your website. Click Choose File or Browse next to Upload. Browse to the image you want to use and select it. If your image is too large, you will have the option of cropping it to meet the size requirement of the Theme. Your new header image will appear as the Preview and will be live on your website. You may also choose images that are in your Media Library. Click the Choose Image to browse your images and select one.